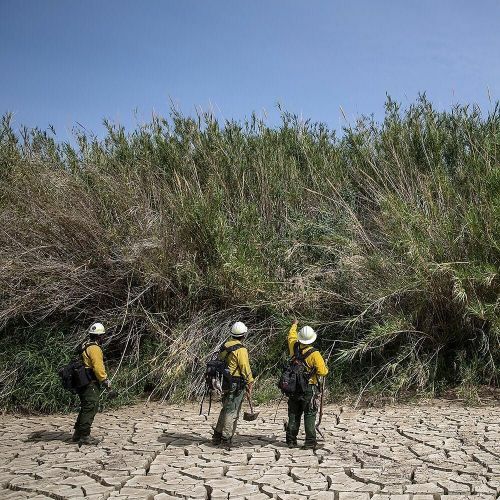 "Workers in front of giant cane, an invasive grass that grows more than 15 feet tall along the banks of the Rio Grande in West Texas. The mile-long thicket of giant cane, pictured here, is one of the biggest sections on the American side of the river and has come to be called La Milpa de Diablo, or, roughly translated, the Devil's Cornfield. It chokes and narrows the flow of the river. This month, @tamirhasacellphone photographed a group of Mexicans and Americans — firefighters, conservationists and park rangers — whose task was not to put out fires, but to set them in a controlled burn to kill the cane. It was hard to tell the workers apart at a distance, just as it was hard to see, along a bend in the river, where Texas ended and Mexico began. #nytweekender" By nytimes on Instagram.